A choice quote, beginning at 3:40: "How do we know that all these benefits are unique to music, as opposed to , say, sports or painting? Or could it be that people who go into music were already smarter to begin with? Neuroscientists have explored these issues, but so far they have found that the artistic and aesthetic aspects of learning to play a musical instrument are different from any other activity studied, including other arts. And several other randomized studies of participants who showed the same levels of cognitive function and neural processing at the start, found that those who were exposed to a period of music learning showed enhancement in multiple brain areas, compared to the others." 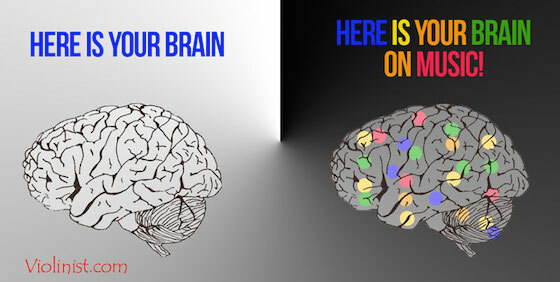 Your brain on music looks more like your brain on Skittles. Those are disco lights, not Skittles, silly!